Shouldn't dragon be 용 in Korean? Yep, but it can also be 드래곤[스] (deu-rae-gon-[seu]). It's the Koreanization of the word "dragon[s]". 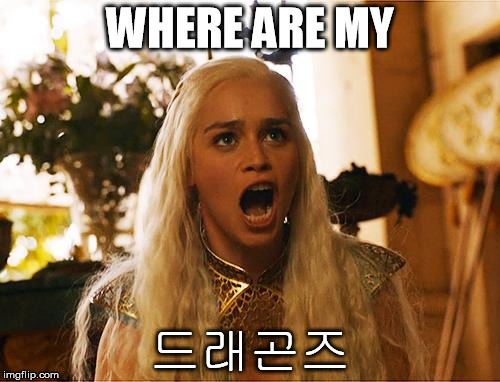 You can't directly spell "dragon[s]" in Korean so it's like that. Pronounce it, it sounds close to "dragon[s]". Btw, the "Dragons" here is for Jeonnam Dragons. Is 즈 at the end instead of 스 a typo or is this done to simulate a Z sound instead of S? But in Baskin Robbins the s sounds [z] and is transliterated as 즈, so there is an inconsistency. Thanks Duo, I know this word is going to be very useful when I start to speak to natives! It looks like this set of lessons (called "Loan Words") are transliterated American words. YES MY FRIEND. Yoongi stan over here. I'm an ARMY too AYEEEEE!!! Now that im used to the pronunciation i dont even have to touch the word to find out the word. Does this mean "western dragons". Korean should have a word for their dragon too, right? Chinese dragon, naga, or something like that. So 즈 sounds to me sometimes like a j and sometimes like a z. Or maybe even the s in "vision." Should I be just thinking of always putting my tongue in the same place for it rather than focusing on anything else? am i the only one who got confused by this? ㅈ what exactly is this sound? I wanna sleep and I'm making typos. It's JUST A TYPO DUOLINGO , A Typo. How do you read this stuff?